When I acquired a copy of Dorie Greenspan’s Baking: From My Home to Yours a couple months ago, my reasoning was I needed it for whatever challenges The Daring Bakers might throw out, but really it’s because I wanted to try every recipe in the book. I’d seen wonderful samples all over the cooking blogs for so long I couldn’t hold out any longer. 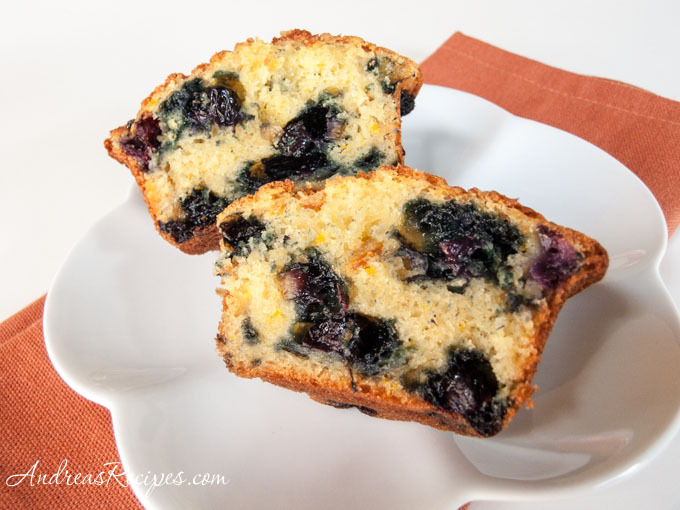 Even though The Daring Bakers made Dorie’s Perfect Party Cake in March, I felt I should start at the beginning and work my way through the book, so we started with her Orange Blueberry Muffins for breakfast one morning, and they were gone in a flash. As I studied the recipe the night before, I realized I had some homemade candied orange peel stored in a jar of sugar in the pantry, and I couldn’t resist adding it. I chopped about 1/4 cup of the peel (sorry, I forgot to weigh it) and then sprinkled some of the orange sugar on top of the muffins. As it turns out, it’s a good thing I added the chopped orange peel because Top Gun was stealing blueberries behind my back, so adding the orange peel helped make up for the loss of the blueberries. 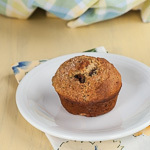 We enjoyed the extra orange flavor, and now I have to make more candied orange peel so we can have these muffins again. The orange and blueberry combination was delicious. And as for the color, they really were that orange! Place the baking rack in the center of the oven and preheat to 400° F. Place the muffin pan on the baking sheet. Pour the orange juice into the large glass measuring cup and add enough of the buttermilk to make 1 full cup (237 ml). Whisk in the eggs, honey, and melted butter. In the large mixing bowl, rub the orange zest into the sugar until you can smell the orange. It should smell strong. Whisk in the flour, baking powder, baking soda, and salt. Pour the liquid mixture over the dry ingredients and use a rubber spatula to quickly and gently stir. 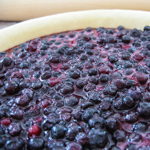 The batter will look lumpy and bubbly, and that's ok.
Gently stir in the blueberries and the chopped orange peel. Scoop the batter into the muffin cups and sprinkle the orange sugar on top. Bake for 22 to 25 minutes. The tops should be golden and springy to the touch. Remove from the oven and allow to rest in the pan for 5 minutes. Carefully remove and allow to cool a few minutes before serving warm or at room temperature. These look amazing! What a yummy summer treat. How do you make candied orange peel? Maris, thanks for catching that! I forgot to link to Jen’s blog. I would have never put the two together because my mind is creative so I am so glad I found your blog. This sounds sooo wonder, now I need to make some. I’ve made those muffins and they are scrumptious! I think there are some adjustments to make in the directions of your recipe “orange blueberry muffins”. 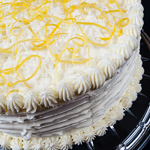 Under the ingredients you have listed 1/3 cup granulated sugar, yet it is never indicated in preparation to use it. Second, during the preparation, step two says to incorporate the melted butter in with the eggs, juice, honey and buttermilk. However, the third step says to rub the zest into melted butter in a large bowl. At first I thought that this meant to add the zest into the liquid mixture, but later in step four it says that the liquid mixture is poured into the large bowl with the dry ingredients (and butter and zest). The butter is used twice in your preparation. Thanks Sam. My typo was using the word “butter” in Step 3 rather than “sugar.” Corrected now. Thank you so much for this recipe. Earlier this year we received a ton of fresh oranges and ended up using several of them to make juice before they started going bad. I was adventurous and decided to make up candied orange peel with the rinds. Needless to say we ended up with 4 quart jars of candied orange peel. Though it keeps great in the fridge, my family quickly became tired of eating things with candied orange peel. I have been searching for additional recipes to use more of it up and saw this recipe. I will be making these tomorrow morning for a different twist to use up our stash. These look wonderful … really, the pictures are great! I love blueberries, so this looks like a recipe I’ll have to try! My daughter, on the other hand, well — maybe I can sneak some blueberries into her diet now.